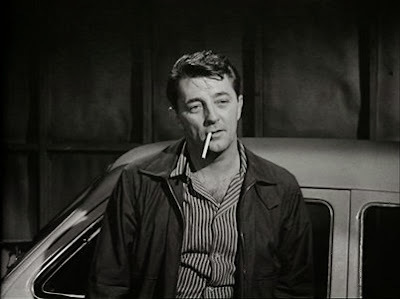 Robert Mitchum’s face – the smile in particular, that smile of cocky yet indifferent bemusement, never getting overly worked up since he treats threats as fun ‘n’ games – lets us know that somehow he knows every detail of what is about to happen, fatalism written in the smoke that curls from his constant cigarettes. More than anything, he is the rugged, lackadaisical evocation of a Man That’s Gotta Do What A Man’s Gotta Do. 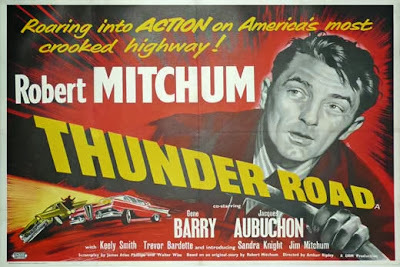 You never expect him to survive in “Thunder Road”, not from the moment he first appears as Lucas Doolin running moonshine on the country roads of Kentucky from Harlan down to Memphis, avoiding not only the requisite Feds but the requisite rural moonshine conglomerate out to either convert him to their side or put him outta business. But that you never expect him to survive is not so much a sign of story weakness (“you can see it coming from a mile away” as they say) as the sense that such a life is simply a curtain of criminality slowly being drawn all around you. Naturally Mitchum is hardly bothered by this prospect. The film’s critical monologue involves him explaining how his past bootlegging life was, as one that pre-dated his involvement in WWII, a different idea, moonshine distilled of a much purer (metaphorical) variety. It is an existence he has essentially given up on re-creating, knowing its time has passed and, thus, HIS time has passed. Life moves pretty fast, and when you’re a bootlegger turned soldier turned bootlegger you don’t have much time to stop and look around. Pretty soon you’ve missed it. Thus, he keeps making those illegal runs to Memphis, counting on the inevitable to catch up with him. Which it does, of course, just in time to coincide with the film’s conclusion, echoing an earlier shot that practically comes casked in foreshadowing. This is a Mitchum project through and through. He concocted the story (James Atlee Phillips and Walter Wise received screenwriting credit), co-wrote the theme song and even co-directed much of the film if you choose to believe the post-picture legends. (That, or Arthur Ripley directed it.) “Thunder Road” props up his own legend as much as it carries him to his demise. He is provided a love interest in the form of a nightclub singer named Francie (real-life singer Keely Smith) who is woefully underwritten, a character without an interior, existing to shine a spotlight on Lucas and say wonderful things about him and how much she loves him and why she can’t bear to see him put his life on the line for a little grain alcohol. He loves her, sure, or says he does, because he knows he’s supposed to, but even in her elegant company he’s a lone wolf. He receives not only a Reflective Character in Francie but a Rebellious Apprentice in the form of Robin, his younger brother, the ace mechanic who keeps Lucas’s automobile in tip-top shape. Robin dreams of running moonshine. Lucas aims not to let that happen by any means necessary. Robin is played by James Mitchum, son of Robert, which is a kind gesture by father, but I must report the facts and the facts are that while younger Mitchum is serviceable in most moments he cannot quite rise to the occasion for the pivotal scene when he calls out his big brother. And his kinda, sorta romance with Roxanna (Sandra Knight), meant as the movie’s gut-punch capstone, fizzles as a result. Not that any of these problems are truly problematic. 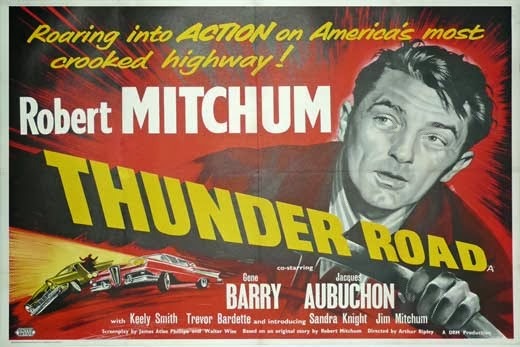 As stated, repeatedly, “Thunder Road” is a Mitchum film. You could have the young Eva Maria Saint begging Mitchum to set aside whiskey running and Kyle Reese trying to pull him off the ledge. Mitchum’d just smile that smile and smoke that cigarette and keep on truckin’. Planet Earth Poet Laureate Bruce Springsteen, who famously ripped off the title of this film for a classic tune, once said: “I realized that after I put all those people in all those cars I was going to have to figure out someplace for them to go.” But in “Thunder Road” the movie the protagonist is never unaware of where he’s going.